For the second time in the history of the AIDS epidemic, a patient carrying HIV was successfully cured of the disease in London. While researchers have described this as a long-term remission of the disease instead of a cure, many are optimistic that the therapies the patient underwent could pave the way for the future of AIDS treatment, and might lead to an eradication of the disease altogether. However, this “cure” requires the use of a bone marrow transplant, a painful procedure for donors that can lead to long-term discomfort. Do you think that bone marrow transplants should continue to be used on a large scale in the search for a cure for AIDS? Should HIV research funding be directed to this method or to other experimental therapies? In light of the recent sexual abuse scandals that have arisen from the political, athletic and entertainment sectors, this year’s International Women’s day could not have come at a better time. This staple of the women’s rights movement was memorialized in 1909 and has been going strong every year since. From strikes and sit-ins to ‘women in business’ panels and concerts, the varied activities that commemorate this day are centered around women’s empowerment, love and appreciation. Internationally, both women and men have banded together on a unified front to show support for their sisters. 2020 might seem like the distant future, but the Democratic presidential primary is already underway. While several potentially major candidates have yet to announce and pundits should probably cool it for at least a little longer, one thing’s clear: the Democratic field is going to be a crowded and ideologically diverse battleground. Candidates span from moderates, like Kirsten Gillibrand and Cory Booker, to progressive stalwarts like Elizabeth Warren and, of course, Bernie Sanders. With such a large and fractured field, there’s a particularly compelling argument to be made for ranked choice voting. If you told me in high school that I’d be the student body vice president at Brandeis, I certainly wouldn’t have believed you. And yet, a few months ago, you put your faith in me to serve alongside our amazing President Hannah Brown as the “face” of the student body. Now, halfway through my tenure, I’d like to share some thoughts on what we’ve accomplished as a team, what I’ve learned, and what suggestions I have for the future. Following an interview with Venezuela’s de facto dictator Nicolas Maduro, Univision anchor and news host Jorge Ramos and his crew were detained in Caracas. Ramos had questioned Maduro about the lack of democracy and humanitarian famine crisis in Venezuela, in addition to the torture of political prisoners who oppose his regime. When Maduro was shown a video of Venezuelans eating garbage, the interview was promptly cut short. Ramos and his production team were detained, and their equipment was confiscated. Although they were promptly set free, many have seen this action as a direct attempt to stifle the truth and journalism in Venezuela, where citizens are experiencing one of the worst humanitarian crises this century. How do you view this detainment in the context of the plight of the Venezuelan people? My focus this year on the Student Union can be summarized by three key words: transparency, affordability and connectivity. Why does our university matter? Here, we ignite our inner fire for knowledge and seek, as free thinkers, “truth even unto its innermost parts.” We desire to exchange, question and argue among ourselves, search and find, contradict each other and move together. This free speech we enjoy within our community fuels every day. Would our enthusiasm not somehow vanish, if we stopped speaking our minds and exchanged fire for fear? This past week, a photo from Virginia Governor Ralph Northam’s page in his medical school yearbook emerged depicting an unidentified student wearing blackface makeup and another wearing the garb of a Ku Klux Klan member during what appeared to be a costume party. Governor Northam initially apologized for being in the photo, only to backtrack the next day and claim he was not in it. Instead, he referenced another “mistake” from his past: wearing blackface for a Michael Jackson impression at a dance competition. Many politicians are calling for Governor Northam to resign. Do you think he should resign, and why or why not? As part of the University’s festival of social justice, DEIS Impact, the Brandeis chapter of Students for Justice in Palestine invited Phyllis Bennis to discuss the complex situation in the West Bank and the Gaza Strip. Bennis, a member of the Jewish Voice for Peace’s Board of Trustees, has spent decades discussing the Israeli-Palestinian conflict. She has served on various United Nations committees, spoken at universities across the nation and written nine books. Most of the pro-Israel community at Brandeis lament the rise of Students for Justice in Palestine, along with figures such as Bennis, simply because the opposition and ideas that run contrary to those at a historically Zionist university seems uncomfortable. 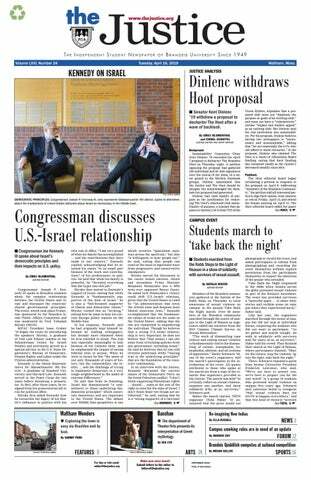 Undoubtedly, Bennis’ visit brings a new discussion of Israel to the Brandeis campus. However, the most consequential impact of this new movement is the abandonment of personal responsibility. The Super Bowl is a celebration of all things American: snack foods, big crowds, boundless passion, nefariously concealed concussion scandals and colossal amounts of money. Perhaps its most American feature is the widespread concept of “watching for the ads.” Across this great nation of ours, countless individuals — myself included — passively watch a sports game they’re not terribly invested in, in order to enjoy being marketed to.